This x-ray shows a malignant bone tumor (osteogenic sarcoma) of the knee. 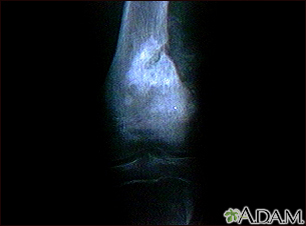 This type of tumor is usually seen in adolescents (around 15 years old). This tumor extends from the bone into the surrounding tissue.